5 year no quibble guarantee. Longer lasting ball bearing motor. Available in 3 sizes, 100mm (4"), 120mm (5") and 150mm (6"). Suitable for wall or ceiling mounting. Complies with the 2006 building regulations. Manufactured using high gloss ABS thermoplastics for strength, durable and easy cleaning. The Gold range is designed for wall or ceiling mounting (pullcord wall mounting only). 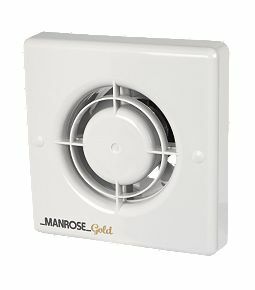 These fans can be window mounted using our window kit available separately.